As a longarm quilter I have PILES and PILES of leftover batting scraps. I have lots of uses for these leftover scraps, but here are some other suggestions that I have collected over the years. Some may be similar, but that is OK.
1. Rough cut a 9 x 12 rectangle to use in your Swiffer - bonus, you can turn it over and use the other side too! 3. I use small odd shaped pieces to dust with. 4 . Use small piece of batting at your sewing table to collect loose threads ( I keep a stack of randomly cut rectangles at the end of my longarm table to collect thread scraps). 6. use them to pretest thread tension settings by sandwiching pieces between muslin trimmings, cutting them into squares of 6-10 inches and moving the sandwich around under the needle as the machine runs in constant or manual mode and with the longer pieces, you can clamp to the take-up roller (I have PVC pipe clamps) and lean on the other end with your tum and also use that to test thread tensions..
More on those muslin sandwiches: use scraps with Muslin to practice machine quilting, but my difference would be that I often zig-zag stitch a bunch of them together to get a bigger piece (on my sewing machine), and this gives me a "challenge piece" because I sew all different types together, and I can see how my practice looks on different battings. 7. Wipe the machine down with it! Several variations on this theme. Cut cotton batting into small squares and keep a stack next to my machine to collect thread snips, and an easy grab to wipe down oil leaks. 8. Make small quilts for use in front of your coffee pot or other places where you get drips! 9. Make quilt as you go placemats. Another placemat suggestion: I love to use my scraps for placemats for myself and to give as gifts. Cut into approx. 14" x 20" pieces and add to whatever you choose for top and backing. I also use this same size of batting scrap to make strip cut mats. These are easy, fast and help use up my fabric scraps, making great placemats or mats for tables under lamps, plants, etc. 10. Use for 'diaper' for your longarm. Tuck a small piece under the bobbin area when my machine is parked. 11. Donate the batting scraps to your local senior center where they can be used to make small crafts. 12. Donate scraps to a group of ladies who make raggedy quilts for charity. 13. The Cotton Theory uses small strips of batting. I have made one of the table runners. 14. A small piece of 80/20 batting around the thread in the guide on my serger type adapter *keeps the thread from knotting* or getting loose. Kind of the same idea as the sponge cube on the Gammill. 15. I use my extra batting for my dog kennels and even donate some to the local animal shelter. The practice muslin pieces I donate to the local animal shelter for doggie or kitty blankets. 16. use small scraps for small projects like pot holders etc. 17. Our local hospital ladies auxiliary uses batting scraps to make "heart" pillows for heart surgery patients to hold to their chest when they have to cough or (heaven forbid) sneeze. Another idea: they use it for pillows to give to all the children who come in the ER 18. I use batting scraps to pack in boxes when I send a package. It is great because it doesn't weigh as much as newspaper and nothing ever gets broken when wrapped in it. 19. Another use for batting scraps - cut them in 5" squares and give them for auction items along with a pattern for one of the 'rag' quilts like the Christmas tree one. 20. How about a *base for fiber post cards* and journal sized quilts? 21. Wrap a big enough piece *around the seat belt* that bites your neck! 23. I use them for fill when I mail out quilts. 25. My friend uses them to make "envelopes" for holding kits that another friend uses in classes she teaches. Anything over 10" goes there. 27. Use them in the winter to "chink" leaky windows or make draft stoppers. 28. Then there are biscuit quilts, raggy quilts, raggy jackets, etc. 29. Wrap it around the broom and use it to knock down the spider webs. (WHAT? you have dust bunnies?? ?- LOL) Just throw it away, no messy broom bristles. 31. Cut it a bit smaller than your lamp base and protect your table. 32. I also use them to clean the wheels and tracks. 33.removing chalk marks on quilt tops. 34. I use small, potholder size scraps to erase the black marker lines off my white board. When the batting gets dirty, I just throw it away. 35. give it to a friend that uses it for stuffing in teddy bears and animals she makes to sell at bazaars and craft sales. 41. pad photo album cover. 42. Cut batting in 2" by 2" squares bundle a dozen together with ribbon and give them to customers for make-up removal. 43. Give to guild members for craft projects - I try to remember to measure and tag scraps as to size just to know if they are big enough for table runners etc. 44.. I make a 6" quilt block and use the smaller piece of batting with it, quilt it up, bind it and give it! 45. You know the small drawers you can get from Walmart in the tool section that holds your nails, and bolts and washers? I use that for my jewelry. I place small pieces of batting on the bottom of the drawer so my rings, necklaces, and bracelets don't slide around when I pull the drawer open. 46. I have done strip quilts with strips 8" or wider batting just to practice on. 47. I use really small pieces to wipe up scraps of cloth that have dropped on a smooth tile floor. 50. I usually keep the scraps of batting to stuff baby toys. 52. I make TONS of the raw edge quilts and have taught all my relatives to do likewise. We take two 8" squares of fabric and put a 6" square of batting in between....sew an X over the sandwich - this makes one block. Then sew all those squares together into a quilt with the raw edges all to one side, either the top or the bottom. Clip the raw edges up to about 1/8 of the seams every 1/4" or so, and wash till it's fluffy. I've also taught school kids to make them, and our church quilting ladies. This is the BIGGEST use of the batting scraps that I have. 53. I use them to *wrap breakables* when mailing items. 54. I place them between my good seasonal glass plates so they don't scratch each other. 55. I sew cotton batting scraps together to make rice bags. Then I either use these hot or cold for soothing my achy body, OR ... I lay them on my quilts to take up the slack while I'm quilting a non-square, non-flat quilt. Kinda like bean bags. 56. I contribute it to anyone that will accept it -- quilt shops, church groups, school groups, relatives, etc. Actually, my trash guys LOVE my scraps. They are always going through the trash cans and rescuing scraps that they want to keep. 59. Use as snow at Christmas for decorating around little trees or your nativity scene. 61. I made a *small padded camera case* to wrap around my point and shoot camera. Put a little pocket in front for extra memory cards. The case and pocket are kept closed with Velcro and the neck strap comes out of the side of the top alongside the Velcro. 62. Mug Rugs? Coasters? Pot holders? 63. I use small scraps of batting as interfacing in little zipper pouches and they are cute little bags etc... If that interests you, you should to check the tension of my machine before quilting by making test quilt sandwiches. You could also make some cute coasters or maybe a padded strap for a camera? 64. They make great dusting cloths. I cut them to fit on my Swiffer and use them to clean my wood floors. 65. Key Fobs - There are several patterns that use 2.5" strips of batting and it's perfect to use leftovers that you've been hanging on to. 67. 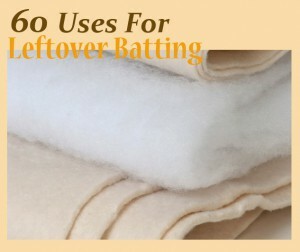 If batting is all cotton, you could make a microwave potato or tortilla bag. OK, so a few more than 60 suggestions. Always like to give more than expected. But, granted, some are similar. Let me know how YOU use batting scraps in the comment section. Thanks to Karen Overton for many of these ideas from Quilts 'N Caboodle. Used with permission.